Stimulsoft Reports.Net is a .NET based report generator which helps you create flexible and feature rich reports. We think that it is very important for the report designer to be quick and handy, because time amount spent for the report creation depends on it. That is why we make it more user-friendly. 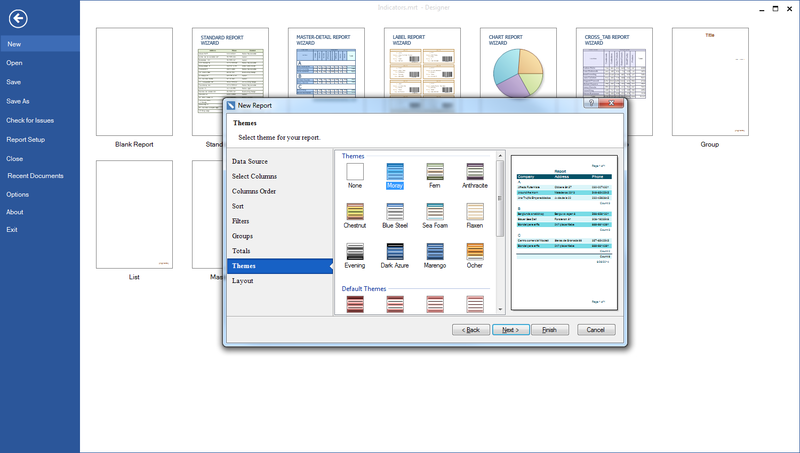 In our report designer, whole report is visually separated into pages in the report template. This allows you to see how elements will be placed on a page of a report. Our designer fully supports drag and drop. Full support of this technology allows you to speed up report creation. We have added plenty of wizards and editors to make changes of properties as easy as possible. Besides, in cooperation with our partners, we have fully translated the designer interface into 26 languages. This makes our customers' work easier. Also, to make the clients' work faster, special commands to create reports are available. We do not stop on what we reached and keep on making our report editor to be perfect! Any report requires data for its work. What does the Stimulsoft Reports.Net offer for you? Our report engine supports all types of ADO.NET. Do you need to get data directly from data server? We support more than 15 types of data servers: MS SQL Server, Oracle, MySQL, Firebird etc. Do you store data in XML? Report engine can get data from XML files too. Do you need to use business objects? Stimulsoft Reports.Net can help you. You can use them as well as other data sources. There is no need for you to rack your brains over the question: how to prepare data for report rendering. Stimulsoft Reports.Net will do this work for you. Sorting, grouping, filtration, joining - all these actions can be done with your data before report rendering. Stimulsoft Reports.Net یک گزارش ساز مبتنی بر دات نت می باشد که به کمک آن می توانید گزارش های انعطاف پذیر با ویژگی های فراوان ایجاد کنید. Stimulsoft Reports.Net به همراه source code ها تحویل داده می شود. تمامی گزارش ها در report designer و با استفاده از اینترفیسی کاربر پسند ایجاد می شود. می توانید از report designer هم در زمان طراحی و هم به صورت runtime استفاده کنید. برای استفاده runtime از report designer حق التالیفی از شما درخواست نمی شود. گزارش های تهیه شده را می توانید هم در Windows Forms و هم ASP.NET مورد استفاده قرار دهید. کامپوننت های فراوانی برای ساخت و ایجاد گزارش در اختیار شما قرار داده می شود از جمله کامپوننت های simple text و کامپوننت های compound special (Chart، Cross-Tab، Container، و سایر). در report designer گزارش کل به چندین صفحه با تمپلیت گزارش تفکیک می شود. به این ترتیب شما می توانید چگونگی آرایش اجزای گزارش در هر صفحه را مشاهده کنید. این designer به طور کامل از حالت drag and drop پشتیبانی می کند. با اضافه شدن تعداد بیشمار wizard و editor ایجاد تغییرات در properties به آسانترین حد ممکن رسیده است. Designer interface به 26 زبان ترجمه شده است. این report engine تمام انواع مختلف ADO.NET و بیش از 15 نوع data server از جمله MS SQL Server، Oracle، MySQL، Firebird، و غیره را پشتیبانی می کند. شما می توانید گزارش های خود را هم در Win Forms و هم Web Forms مرور کنید. Stimulsoft Reports.Net می تواند گزارش های render شده را در بیش از 30 فایل فرمت مختلف ذخیره کند. علاوه برآن، این report generator امکان ویرایش مستقیم گزارش های render شده در Preview Window را برای شما فراهم می کند.